In short, an improving economy tends to dampen investor interest in gold. This will put further downward pressure on the price of gold, hurting gold miners like Silver Wheaton, Barrick Gold, Goldcorp, and Newmont Mining on the bottom line. That will in turn drive the price of Market Vectors Gold Miners ETF further down. Gold mining is expensive and hard, and gold miners have zero pricing power. A week or so ago, I wrote an article that listed three reasons to buy Market Vectors Gold Miners ETF (NYSEMKT:GDX). It's important to understand that gold went on an unprecedented bull run from the early 2000s through late 2011, but it has largely been in decline since. 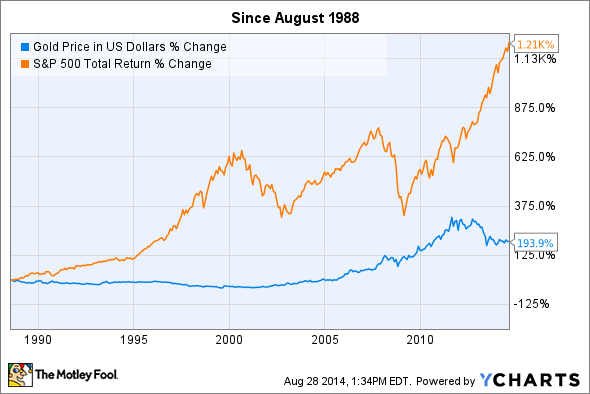 Further, gold has historically been an underperforming asset as compared to the stock market. And while the Market Vectors Gold Miners ETF is made up of stocks, the companies are all in the gold mining business, and this group tends to move with the price of gold. With that said, here are three reasons the Market Vectors Gold Miners ETF could fall. 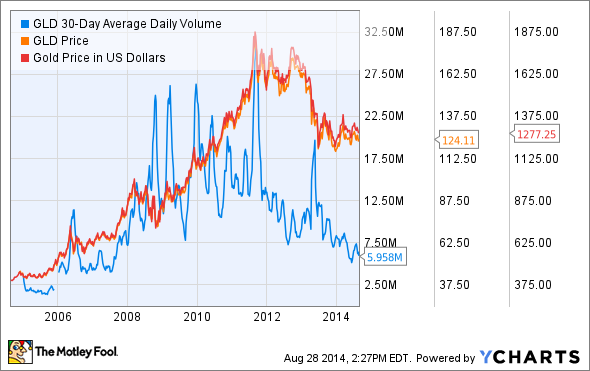 Should you consider limiting your exposure to gold and gold miners? Let's take a closer look. The story is much the same when you go back even further in time. The reason has little do with gold being a "bad" investment so much as its limited demand for industrial and consumer goods. The reality is, much of gold's bull run over the past decade was a product of speculative demand as more people invested in gold out of fear of a currency collapse. In many ways, this is the very definition of a "bubble," where the price of gold was not sustained by actual demand, but speculation. Therein lies the risk for investors. How do you accurately predict that the price of gold will rebound in a measurable way? You can't with any level of accuracy when the source of demand is so hard to measure. While this isn't guaranteed -- see my comments above about the difficulty in predicting what gold prices will do -- it seems likely. It was recently reported that median American household annual income has increased roughly $2,000 from 2011. Yes, median income levels are still down from their peak -- and even down from 2000 -- but this is a sign that more families are doing better. This is the kind of trend that will lead to less uncertainty about the economy. Less uncertainty will lead to less interest in hedging against the collapse of the currency. The result? Gold likely continues to underperform, and gold miners -- which depend on gold being expensive and in demand to make money -- could see their stocks fall further as it gets harder to make money. GLD 30-Day Average Daily Volume data by YCharts. This is a relatively good measure of speculative activity in gold versus industrial demand, and the trend is pretty clear. GG Net Income (TTM) data by YCharts. In short, that's a lot of red ink. 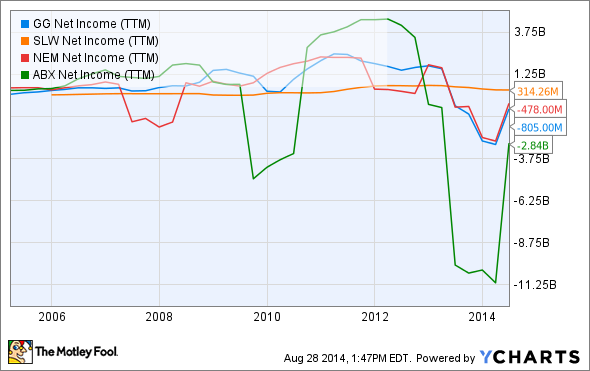 Over the past 12 months, these four companies have combined to lose $4.4 billion, on $13 billion in revenues. That's with U.S. gold prices still well over $1,200 per ounce. The biggest risk with gold miners (and gold itself) is how incredibly difficult it is to predict what the price of gold will do. A much smarter long-term investing strategy is to find businesses that have real competitive advantages versus businesses tethered to a highly volatile commodity, like gold, which price seems to be driven more by sheer speculation rather than industrial use. I'm not saying it's impossible to make money with gold, or gold miners. What I am saying is it's very difficult to accurately predict gold's value outperforming the stock market in the long term, especially when much of gold's price is driven by speculation on the health of the broader economy. This will further challenge gold miners' ability to make profits, hurting their share prices, and the price of the Market Vectors Gold Miners ETF. Maybe I'm too optimistic, but I think American businesses and the global economy are a better bet for long-term investors.